A reminder to take on challenges together, Sarah Janece Garcia's piece is inspired by endangered species. 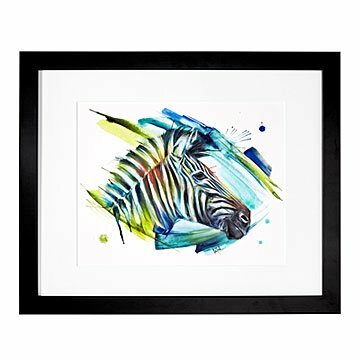 Zebras truly show their stripes when they work as a team, the dazzle uniting to thwart predators through a dizzying display of comradery. A reminder to band together to take on challenges, this artwork by Sarah Janece Garcia comes from a moving suite of paintings inspired by endangered species. The collection captures the splendid faces of threatened species from around the globe. These amazing animals rely on humans to speak up for them, honor their importance, and protect their future. With this collection, the artist hopes to expose the connective thread between humans and animals, and inspire advocacy through art. Made in Dallas, Texas. Printed and framed in Portland, Oregon.